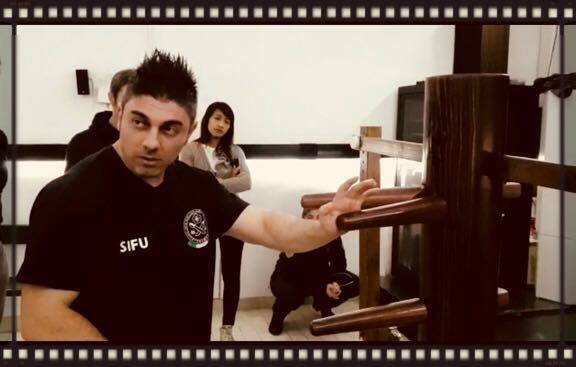 Si-Fu Marcello Senes (chinese name Kwok Ming Kong 郭明剛) is a 3rd generation Wing Chun Master. He’s a direct student of GM Samuel Kwok, who is a direct student of GGM Ip Man’s sons, GM Ip Chun and GM IP Ching. He has beyond 20 years of experience in the Martial Arts. He was appointed President and Chief Instructor of the Samuel Kwok Wing Chun Martial Art Association Italy by GM Samuel Kwok. He’s an heir of the Ip Man Family for direct lineage. He was awarded Italian Master of the year for the Ip Man Wing Chun at the Munich Hall of Honour and at the Suisse Hall of Honour, and Outstanding Contribution to Martial Arts at the Hall of Fame Martial Arts Italy World Union and Grand Masters for Wing Chun promotion. He is author of various articles in famous International Magazines on Martial Arts. In 2017 received the Lifetime Member of the Samuel Kwok Wing Chun Martial Art Association, other prestigious recognitions that only the most devoted direct students receive. In 2018 established Kwok Ming Kong Wing Chun Martial Art Association, with the objective of promoting IP Man’s Wing Chun to the world. In 2018 he received the Certification of Instructor as permanent member of the Ving Tsun Athletic Association of Hong Kong, founded by GGM Ip Man. He is a Co-Founder of the Martial Heroes Hall of Honors in Venice Italy and Executive Vice President of the Martial Heroes Council, an annual red carpet International Event boasting many of the Grand Masters, Actors and interpreters of our time. He is the Executive Vice President of the Summa Maxima Warriors Arts, a Martial Arts Organization recognized by the WHFSC – World Head of Family Sokeship Council and other International Hall of Honors. It is correlated with Martial Heroes Hall of Honors. Many famous International GMs cooperate with Summa Maxima Warriors Arts and they support it. He was recently awarded as an Official Member of the 2018 Hall of Fame Argentina and among “The 300 best Martial Artists of the Year 2019” at the World International Self Defense Association in Barcelona, an important recognition also awarded to famous characters such as Jason Statham, Donnie Yen, Tony Jaa and Art Camacho. Si-Fu Marcello Senes (nome cinese Kwok Ming Kon g 郭明剛) è un Maestro di 3° generazione di Ip Man Wing Chun. È uno studente diretto di GM Samuel Kwok, a sua volta studente diretto dei due figli di GGM Ip Man, GM Ip Chun e GM Ip Ching. Ha oltre 20 anni di esperienza nelle Arti Marziali. È stato nominato Presidente e Responsabile Tecnico della Samuel Kwok Wing Chun Martial Art Association Italia dal Gran Maestro Samuel Kwok. Egli è un erede della Famiglia Ip Man per lignaggio diretto. È stato premiato come Maestro Italiano dell’anno per la Ip Man Wing Chun alla Munich Hall of Honour e alla Suisse Hall of Honour, e come Contributo Eccezionale alle Arti Marziali alla Hall of Fame Martial Arts Italy World Union e Grand Masters per la promozione del Wing Chun. È autore di vari articoli su famose riviste Internazionali di Arti Marziali. Nel 2017 riceve l’Associazione a vita della Samuel Kwok Wing Chun Martial Art Association, un altro prestigioso riconoscimento che solo gli studenti diretti più devoti ricevono. Nel 2018 fonda la Kwok Ming Kong Wing Chun Martial Art Association con lo scopo di promuovere l’Ip Man Wing Chun nel mondo. Sempre nel 2018 riceve la Certificazione di Istruttore come membro permanente dalla Ving Tsun Athletic Association di Hong Kong, fondata dal GGM Ip Man. È il Co-Fondatore della Martial Heroes Hall of Honors a Venezia in Italia e Vice Presidente Esecutivo del Martial Heroes Council, un appuntamento Internazionale annuale fisso che porta sul tappeto rosso di Venezia alcuni tra i Grandi Maestri, Attori e interpreti più affermati del nostro tempo. È Vice Presidente Esecutivo di Summa Maxima Warriors Arts, un’organizzazione di Arti Marziali riconosciuta dal WHFSC – World Head of Family Sokeship Council ed altre Hall of Honors Internazionali. Essa è correlata alla Martial Heroes Hall of Honors. Molti famosi GMs internazionali cooperano con Summa Maxima Warriors Arts e la supportano. Recentemente è stato premiato come membro ufficiale della Hall of Fame Argentina 2018 e tra i 300 migliori Artisti Marziali dell’anno nel 2019 presso la World International Self Defence Association a Barcellona, un riconoscimento importante che vede tra i premiati personaggi come gli Attori Jason Statham, Donnie Yen, Tony Jaa e Art Camacho.